Today's tutorial for Falliday Fest is called Two Tier Eclipse - it's a fun way to use your dies for a raised camouflage effect. For my card, I positioned the Peace stamp in my MISTI then used 2 Distress Oxide pads to ink it up, just adding a little ink each time. I misted the first round of impressions to let the inks bleed and feather out, then stamped again over the background that created. The feathers were cut after the stamping was done, then layered, popped up on foam tape, and replaced into the panel. It's a really fun effect to create! Want to try it yourself? 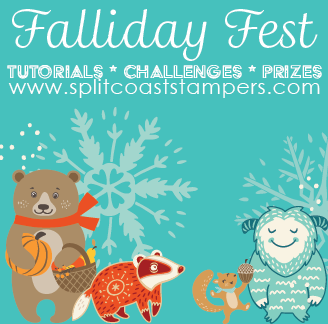 There are tons of tips and tricks in Sue's video - come over to the Falliday Fest Challenge Forum for all the details! This card is really surprising and beautiful ! I love that technique and would absolutely try it some day or the other. Very dreamy look on this card! Thanks for sharing the technique!